New government micro site will showcase the many business benefits of locating in one of England’s 24 Enterprise Zones. 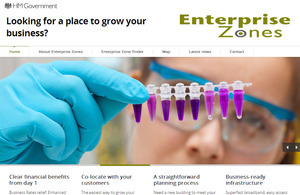 The Enterprise Zones site will help businesses find a place to grow. The Department for Communities and Local Government has launched a brand new micro site to promote Enterprise Zones across England. The site is designed as the first point of call for all budding entrepreneurs and businesses looking to grow and expand. By choosing to locate in one of the 24 zones which cover a variety of industry sectors, small start-ups and expanding businesses will benefit from a number of measures including discounted business rates, simplified planning procedures and business ready infrastructures including super fast broadband. The department has joined the Department for Business Innovation and Skills and UK Trade and Investment in the way it seeks to speak to businesses and entrepreneurs in order to attract inward investment to the UK. Enterprise Zones are a route to generating jobs and businesses, helping to rebalance the economy and drive local and national growth and enterprise.